Eclectic style is one of the most personal, creative and fun ways to decorate your home. Yet it is also arguably the hardest style to pull off at the best of times. The misconception with most homeowners is that if you throw in a blend of mismatched decor and a bright color or two, you will ultimately end up with an eclectic space. This could not be further from the truth. 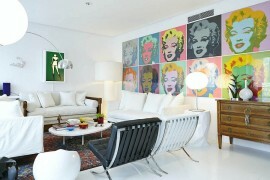 Eclectic interiors need as much attention as (if not more than!) those embracing any other decorating style. It is all about the curated mismatching and careful interlinking of contrasting styles. An exercise that requires poise and panache! If you are less confident about taking the plunge into the world of eclectic design, then why not test it out in a smaller, more controlled area of your house? The eclectic home office not only offers the perfect test case, it is a lot easier to pull off than an exquisite eclectic bedroom or living area. 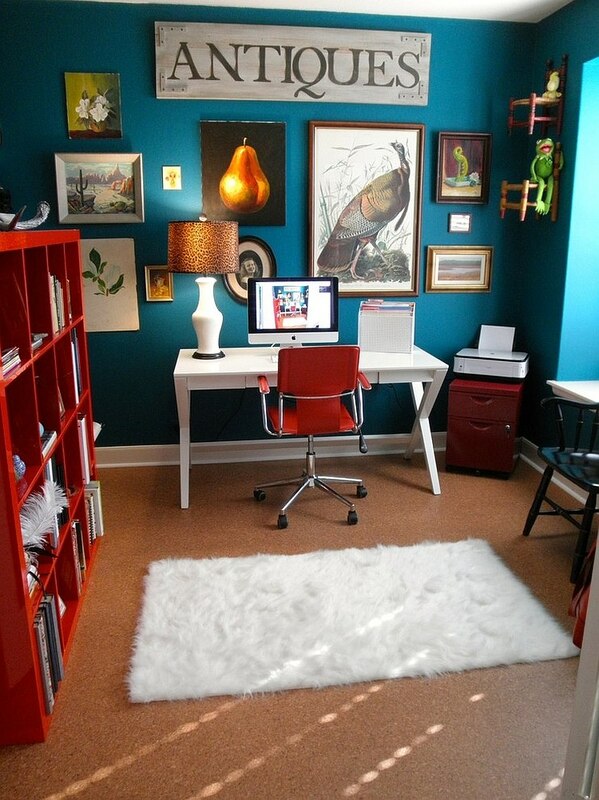 And today we have 10 stylish and snazzy home offices in a perpetually popular color – Blue! Home offices come in all kinds of shapes and sizes, and this one relies on a built-in library wall to take care of all the storage needs. The gorgeous library wall in blue obviously is the defining trait of this home office, but the luxurious Egg Chair along with the small table is also an important part of the overall design. 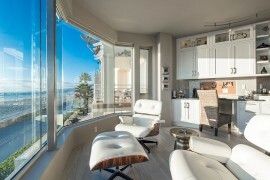 It adds a hint of Midcentury modern appeal to the room, while the contemporary chair in white completes the setting. 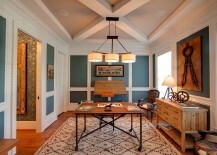 This is one eclectic home office where there is no shortage of display space! Navy blue is an impressive and classy shade that draws your attention easily. 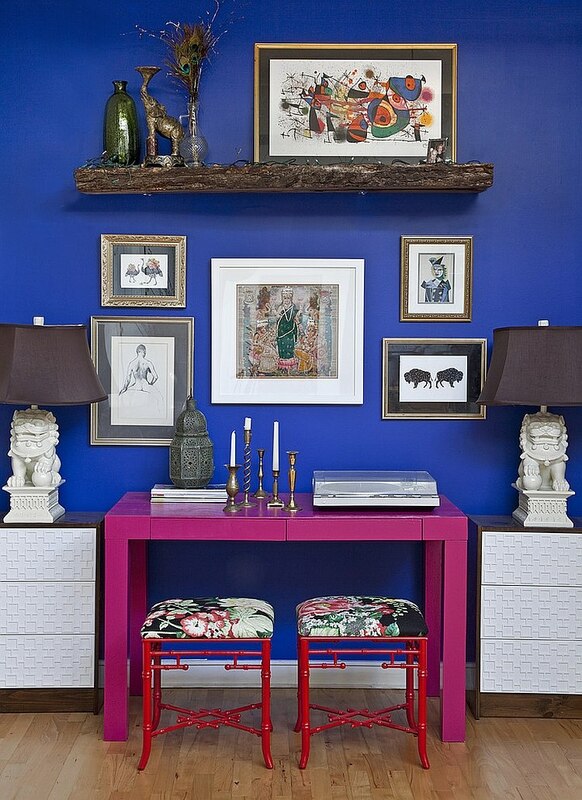 Yet shaping a room that is filled with this rich, bold color can be a tricky affair. This cool home office gets it done with the painted window shutters and wall paneling, giving the traditional setting an edgy, industrial vibe. A light blue ceiling and plenty of natural light ensure that the space does not seem too overwhelming. This might be a small home office, but it does bring along with it a lot of fun ideas. 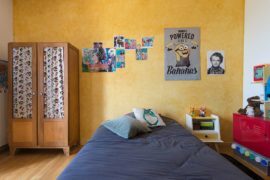 For starters, we love the use of photo-labeled files and the small storage boxes that add a pop of green to the eclectic room in an understated fashion. Simplicity is the key here, as the floating desk and petite stools ensure that the tiny space still feels airy and elegant. Beautiful blue walls and white oak flooring complete the look. A plush chaise lounge in pink, a leather club chair and a colorful wingback make sure that there is no dearth of seating options in this vivacious home office. 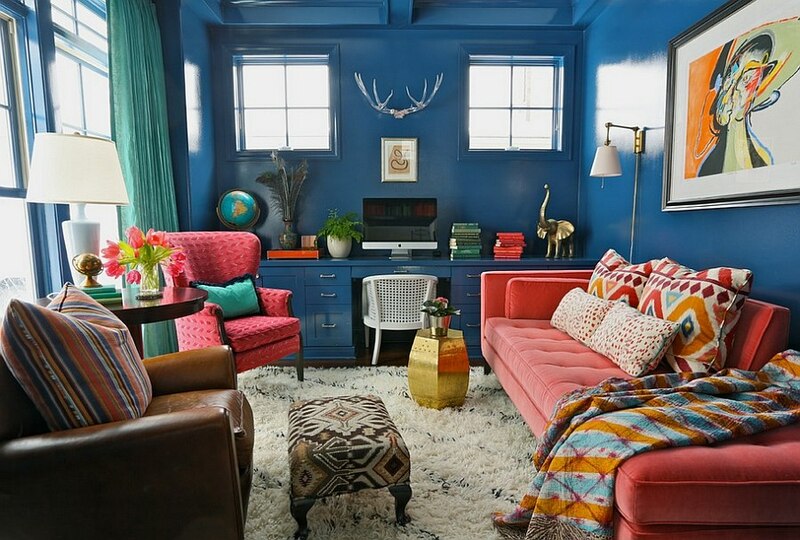 Even the blue on the walls with its high gloss finish enlivens the room further, while smartly arranged books, turquoise drapes and a golden side table bring in even more color! If you are looking for a perfect reading room / home office that is all color, class and eclecticism, your search ends here! We have always loved the timeless Parsons desk for its understated elegance, sleek silhouette and the concealed storage that it offers. 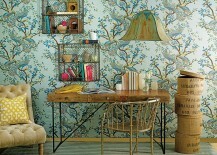 This is one desk that is ideal for the feminine home office! Paint it in a shade of purplish-pink, and it seems to be even more apt for such a setting. The side cabinets in white from IKEA also stand out thanks to the brilliant blue backdrop, while a picture ledge in wood brings natural warmth to the small home office. Here is a perfect example of combining several different individual elements you like to shape a gorgeous, eclectic home office. A bookshelf in glowing red, an ‘antiques’ sign hung on the wall from Pottery Barn and a contemporary desk in white are seamlessly combined in this room painted in ‘Pacific Ocean Blue’! 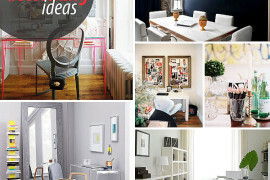 Gallery walls such as the one here are expected to top the decorating trend charts in 2015, making them a cool addition. 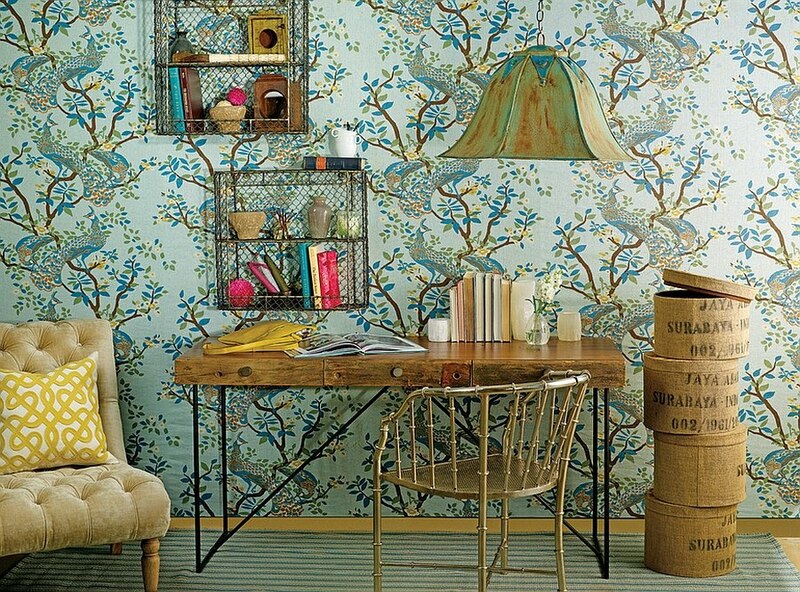 The home office is a space that should increase both your creativity and work productivity. This relaxing and graceful home office seems to be just the place for that. 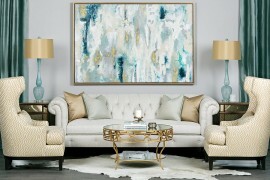 White and blue is a timeless combination that works well in any room. 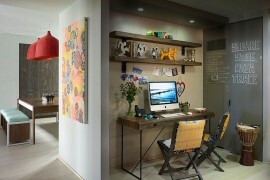 The addition of a table, sideboard, chairs and lighting fixture with rustic overtones gives the office a fun twist. 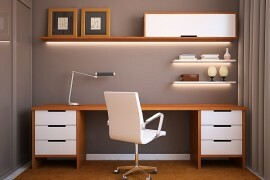 Yet by simply swapping the decor, you can easily transform this room into a contemporary home office. 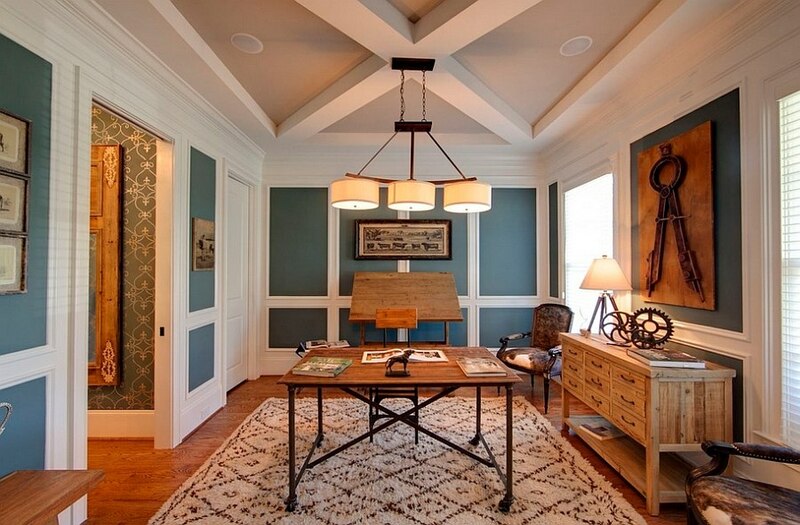 ‘Soothing’ is the word that comes to mind when you take a look at this relaxing home office. 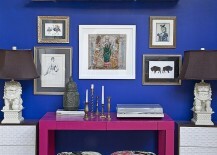 You need not always turn to paint to give the eclectic space a cool, blue look. Here, designers have turned to blue accents in the form of twin chairs, a table lamp and a white rug with a blue pattern to usher in the color. Just exquisite!